Johann Sebastian Bach would never be as appealing for his adventures in life and good looks like, say, Mozart or Beethoven. His famous portrait showing him as an old man in a white wig holding a piece of sheet music scared away many generations of young music lovers. I think that this picture doesn't do justice to this composer capable of great emotional deepness. Mozart had an exciting death, writing his Requiem in his deathbed, adding popularity points to his character. Beethoven was kind of a romantic hero and became deaf making him even more appealing. Bach? He never left Germany and his life passed without many interesting facts standing out. Another example of a great classical composer suffering from low popularity because of his not-so-interesting lifestyle is old Haydn, the father of the symphony, who is always overshadowed by the naughty Mozart. But I think that this injustice also gives greater merit to Bach, in that all his popularity is due to his music, and not any extramusical fact. It is better this way, you can know him much better through his music than through words. You are fortunate in reading this article, you are going to experience the most wonderful and deep music ever composed, you'll start a journey that will last a lifetime. You'll never get tired of Bach's music, if you start here you will love it and explore it for the rest of your life. The best way to get in touch with Bach's music, or with music by any other composer is starting with the most well-known pieces, the ones you heard in commercials, movies, video games, etc. Air on the G string: One of the most famous pieces of classical music. It is featured in innumerable movies, anime series, video games, etc. Rock band Procol Harum wrote a song inspired by this piece that became a worldwide hit and it is still heard today: "A whiter shade of Pale". Toccata and Fugue in D minor: the most famous piece written for organ. It is always associated with Halloween and horror movies. An orchestral version was featured in Disney's Fantasia. Jesu, Joy of Man's Desiring: the staple music of weddings. Badinerie: a popular ringtone in cellphones. It is a flutists' showpiece. 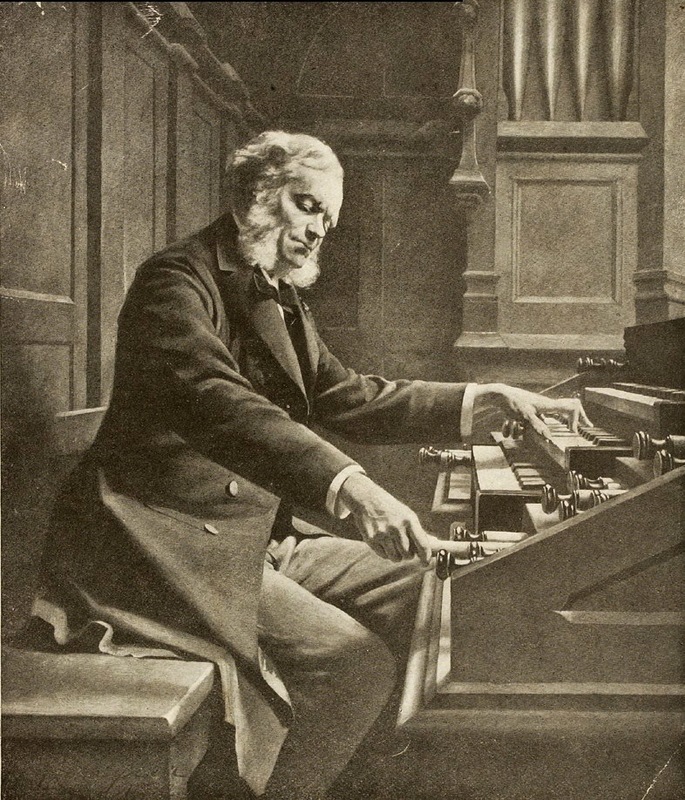 Prelude in C major: This piece became famous by the musical setting by Charles Gounod of the "Ave Maria". He based this piece in the prelude. Young Johann Sebastian Bach. 1715. The Leipzig years as related by Anna Magdalena, Johann Sebastian Bach's second wife. Our family continues to grow quickly! In fact, since we moved to Leipzig ten years ago, I have had a baby every year. So, yes, our home is getting more and more crowded with our growing family. In addition, many friends and extended family members often stop by for a visit and sometimes even stay for weeks at a time to work with Johann Sebastian and to make music together. One of our older sons, Carl Phillip describes our home as a "dovecote" and I tend to agree. There is always something going on but it is, in general, a harmonious and pleasant home. Why I even have several linnets (beautiful little songbirds with red breasts and foreheads) in our home. They make such a sweet accompaniment to the music of our home. The older children are such a help with all the babies and Johann works hard to provide enough for all of us. Sadly, though, Johann Sebastian and the rector of St. Thomas School, one of my husband's many bosses, is a difficult man and their relationship is acrimonious at best. Therefore, to avoid conflict, Sebastian has started spending more and more time at Zimmerman's Coffee House, which is just down the street from our home. At Zimmerman's, a wonderful group of musicians called the Collegium Musicum, regularly perform there. I think my husband will soon take over the direction of the group. He has already started composing wonderful music for them. He is so happy when he is working with this talented group of musicians. Johann Sebastian and I had a wonderful New Year's celebration this year. We were invited to Cothen to play and sing for the New Year's Day festivities at the Court. It was good to be away from Leipzig for a few days and have the opportunity to see our old friends and make music together. In addition, our dear friend, Prince Leopold, paid us both very well. It brought back so many memories of our grand times in Cothen. Back in Leipzig, however, my dear Johann Sebastian works very hard but is very often unappreciated. Unfortunately, my husband also has a rather short temper at times, which makes his work situation difficult. Then with the loss of five of the eight children we have had since moving to Leipzig, he is often weary and sad. The older children and I do what we can to help. Finally, a new rector has been called and Sebastian really likes and respects this man! Matthias Gesner is our hero and he has come along just at the right time. He is the person who is going to step in and make everything right again. Herr Gesner became rector of the St. Thomas School and did five important things: declared a truce between my husband and the council; made sure Johann Sebastian received the pay he was due; refurbished the school; relieved my husband of his teaching duties; and made music important again at St. Thomas. Gesner got things on track in Leipzig for us. What a wonderful difference this man has made in our lives. This vignette is one of a dozen anecdotes in the organ and media event, Bach, and Sons, performed by Dr. Jeannine Jordan, concert organist. Bach and Handel each in their own way were a great influence on later generations of composers. Both of them, in their own personal way, summed up the major styles of European music. Handel cultivated a concerto that was based the style of Correlli and Bach cultivated a concerto that was based on the style of Vivaldi. Handel perfected the Italian opera and the English Oratorio, while Bach perfected the cantata, the German Passion, and the Latin mass. Handel's music relies more on melody and Bach's relies more on counterpoint. This is not to say that Bach couldn't compose good melodies or that Handel couldn't write good counterpoint. It is merely a general observation. Also Bach relied more on phrasing while Handel relied more on dynamics. Although they were both quite adept at using contrasts of texture to create interest, this technique was more important in Handel's music. Handel's music, for the most part, is more vocally oriented, and Bach's music is more instrumentally oriented. 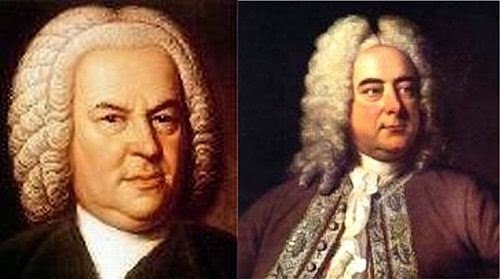 They both were masters of the great European styles of their time, but Handel was much more influenced by the Italian style than Bach, and Bach was more influenced by the German style. It should also be mentioned that Handel's music is easier to perform than Bach's. This is certainly one reason that Bach's music was not as popular in his lifetime as was that of Handel. Let's discuss Bach's influence first. The most widely disseminated work of his in his own lifetime was the Well Tempered Clavier, a huge work, in two volumes, each volume containing a prelude and fugue in every major and minor key, totaling 48 pairs of preludes and fugues. This work is intended to be didactic as well as entertaining to the keyboard player. It was Bach's intention that the player of these wonderful pieces would not only find them entertaining and joyful to play, but also would gain, from performing them, insight into compositional techniques, especially counterpoint. Many keyboard teachers were still using the WTC a generation after Bach's death, indeed, even Chopin's piano teacher was using this book in the early nineteenth century. The Well Tempered Clavier of Johann Sebastian Bach is one the most seminal works of music ever produced. Generations of composers learned the art of counterpoint by playing and studying this great collection of preludes and fugues. Most of Bach's music was ignored until the latter half of the nineteenth century when the Bach revival got underway. However certain works of Bach, most notably, The Well Tempered Clavier, were kept alive by a small circle of intellectuals. A man by the name Baron Van Swieten was among these great musical connoisseurs. He hired the twenty-six year-old composer, Wolfgang Mozart to direct his small orchestra during his weekly private concerts which were held on Sunday afternoons. He loaned Mozart a copy of the WTC so that he could study and play it in his leisure time. He paid Mozart to arrange some of the fugues of the WTC for string trio. Mozart was amazed by the genius of this work. It was a profound crisis in Mozart's life to discover such extraordinary contrapuntal music, the likes of which he had never known. Suddenly his counterpoint, which was always very good, became even better. His counterpoint kept getting more and more complex after his encounter with the WTC. At the age of thirty three Mozart heard one of the Bach motets and was transfixed by its intricate complexity and great beauty. The choirmaster at Leipzig gave Mozart a copy of the score to all six of the Bach motets. He kept these for the rest of his short life, (he had less than three years left to live) treasuring them like the precious jewels they are. They were a profound influence on his late style. In the last two years of his life Mozart's counterpoint became even more exquisite and complex than before. As for Beethoven, he was raised on Bach's WTC. He could play through book one in its entirety when he was only eight years old. Despite the fact that Beethoven knew the WTC and most other keyboard music of Bach thoroughly, he was not particularly adept at counterpoint, at least not in his early years. Being interested in the more homophonic style in vogue at the time, the expressiveness in his music relied more on thematic relationships, harmonic movement, and transformation of motifs. Also I would say that Beethoven relied more on rhythmic iteration and rhythmic transition than any other composer. Nonetheless, his early experience with Bach's keyboard music, especially the WTC, was invaluable for him. In his later years, wanting to compose certain pieces in a more contrapuntal style, Beethoven worked hard at mastering counterpoint. He returned to the music of Bach and Handel, and even studied Palestrina. In his late music, he developed a style of counterpoint that is more reminiscent of Handel than Bach. His fugues in his late period are very rhythmic in nature and quite unique in the history of music. He was found of using fugue themes with repeated notes and rather angular outlines. In the last decade of his life Beethoven proved himself to be a capable contrapuntalist, even though it can be said that his counterpoint is sometimes a bit awkward. The ungainliness of his counterpoint actually gives it a certain power, a sense of struggle, unique to his music, and at times even quite charming. It may be hard to assess how much he gained from Bach and how much from Handel. He seems outwardly to have been more influenced by Handel but his knowledge of Bach's keyboard music was certainly invaluable to him. It is hard to say how much of Bach's vocal music Beethoven had seen. He wrote letters to publishers between 1810 and 1824 requesting them to send him copies of the B-minor Mass but it is not known if he ever received any copy of it. Beethoven had access to the libraries of private collectors such as the Archduke Rudolph, Baron Van Swieten, and others. In these private libraries he could have read many vocal works by Bach, Handel, and other composers. As mentioned above, Chopin's piano teacher had his students play the WTC. Chopin loved and respected this great tome his entire life. On that famous trip he took with George Sand, to Majorca, it was the only music he took with him. The influence of the WTC on Chopin was profound. Most people don't think of Chopin as a contrapuntist, and it is true that one does not find much in the way of imitative counterpoint in his music. He never composed any fugues, except as an academic exercise when he was still quite young, and there are not many canons by Chopin. However it can, and should, be said that Chopin's counterpoint is exquisite. No other piano music in the entire nineteenth century has such smooth voice-leading. The inner voices in his music are almost as melodically interesting as the bass and treble voices, and the music has a transparency that allows one to hear each separate line clearly. Each voice in his piano music, flows mellifluously and smoothly, with never an awkward measure. The influence of the WTC on Chopin should not be underestimated. Of course it goes without saying that Brahms was influenced by Bach. More than any other composer, Brahms studied the music of previous composers. He was certainly very fond of Handel but he absolutely loved Bach. Brahms was, perhaps, the greatest contrapuntist of the nineteenth century and to this he owed a certain debt to Bach. Schumann also loved Bach and paid homage to him in his Six pieces in Canonic form, opus 56. Schumann recommended playing one prelude and fugue from the WTC per day. As for Mendelssohn, Bach's influence on Mendelssohn can be most easily seen in his preludes and fugues, which are somewhat reminiscent of some of the preludes and fugues in the WTC. The music of J.S. Bach was kept alive only by a small circle of intellectuals until the Bach revival that was kicked of by Felix Mendelssohn with his historic performance of The St Mathew Passion in March of 1829. Bach's vocal and instrumental music was gradually becoming more available in print since the last decade of the eighteenth century but Mendelssohn created a greater awareness of the greatness of his music. Then in 1850,on the hundredth anniversary of Bach's death, the Bach Society was formed in Germany. 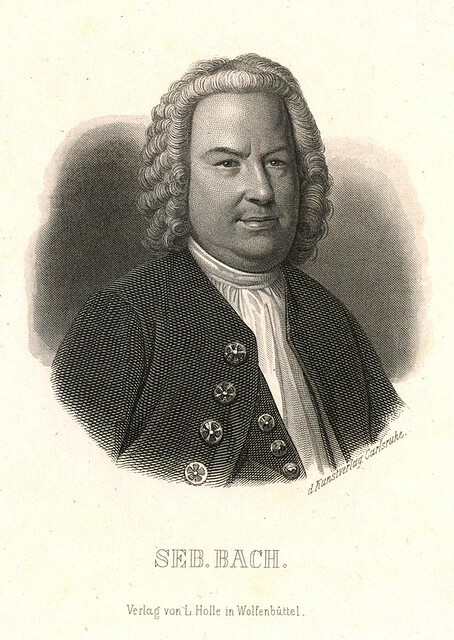 The Bach Society's raison d'etre was to publish every extant work of J.S. Bach. This huge project was not completed until the very end of the nineteenth century. Handel's influence on later generations was perhaps more direct. His operas and oratorios are very appealing. He certainly knew how to please a crowd, yet there is so much more than mere pandering to the masses in his music. His juxtapositions of strongly contrasting textures, his carefully times use of dynamics, his beautiful melodies, and his ability to eke out so much expressiveness from one motif, make his music a virtual compendium of compositional technique. Although Mozart knew only a small fraction of Bach's music, he was thoroughly familiar with the music of Handel. During his childhood trip to England he became well acquainted with Handel's music and he never lost his taste for it. To anyone familiar with Mozart's liturgical music, it is obvious that his knowledge of Handel was deep and thorough. You can hear Handel's influence in some of Mozart's early works, such as The Solemn Vespers, and in later works such as the C minor mass and the Requiem mass. In fact, the opening page of Mozart's Requiem, beautiful as it is, is merely a reworking of the opening choral movement of Handel's funeral music for Queen Caroline. And the glorious double fugue in the Kyrie from the Requiem, uses as one of its two themes, a slightly altered version of the theme that Handel used for "With his Stripes, We are Healed" from his "Messiah." By far, the major influence of Handel on later generations was through his oratorios, the most famous of which is "Messiah." Baron Von Swieten (mentioned above) commissioned Mozart to re-orchestrate this great work as well as Handel's "Acis and Galatea," "Alexander's Feast," and "Ode for St Cecilia's Day." "Messiah" is the most thinly scored of Handel's oratorios, mostly because he was writing it for the city of Dublin, and having never visited that city, did not know what instruments would be available. Messiah is scored for the basic Baroque orchestra, which consists of strings, oboes, and bassoons, with trumpets and kettledrums reserved for the more celebrative numbers. Not only did Mozart add many instruments to the score but he altered many of the arias. Some of them he cut short, or altered certain passages. In some of the arias Mozart changed the harmonic structure. But in the choral movements, he made few changes other than adding instruments to double each voice in the choir. He did the same to "Acis and Galatea." Also, "Acis and Galatea" Mozart added an instrumental countermelody to each aria. These marvelous works would have survived without the Mozart versions, however they became even greater masterpieces when reworked by Mozart. The popularity of Handel's "Messiah" is not to be underestimated. It was immensely popular in his day and has remained so, influencing many composers, especially Mendelssohn. Mendelssohn's two oratorios are obviously influenced greatly by Handel. As mentioned above there can be found a certain Handelain influence in Beethoven's music. Many of Beethoven's grand themes sound as if they could have been written by Handel. A good example is the main theme to the Consecration of the House overture. More than once in his life Beethoven expressed his opinion that Handel was the greatest composer who ever lived. It should be mentioned, however, that Beethoven knew very little of Bach's music outside of the keyboard works. In general, the nineteenth century, composers were influenced by the grandeur and power of Handel and the exquisite, complex counterpoint of Bach. The most creative of these composers were able to incorporate into their own unique style what they learned from these masters. Bach and Handel were both incredible in their own right, and they were also seeds that bore great fruit in future generations. The influence of these composers should not be underestimated. Bach's WTC alone was a tremendous influence, as was Handel's Messiah. It seems to me that Handel's influence is more direct and obvious, some examples are Mendelssohn's "Elijah" and much of Mozart's church music. Unfortunately, many of Bach's great choral masterpieces were not heard or published for over 150 years. What would Mozart have thought of Bach's B minor mass, or St Mathew Passion? How would the Christmas Oratorio or the Magnificat have influenced Mozart if he had known these wonderful pieces? We will never know. The influence of Bach is more subtle than the influence of Handel and can be seen mostly in the way other composers learned counterpoint by studying his works. If you want to learn how to create a bass line that goes well with the melody, supports the harmony, yet has beauty, and an independence and logic of its own, there is no better composer to study than Bach. If you want to compose contrapuntal music with complexity, yet with smoothness, clarity, and transparency, then studying the music of Bach and Handel is indispensable.